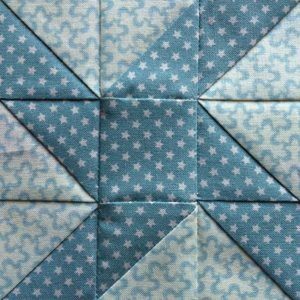 My Birds in the Air block has some American patriotic feel about it, owing to the star print, of course. Looks to me more like jet fighters flying in formation than a flock of birds (giggle). Previous bird related blocks were Darting Birds, Flock, Hovering Birds, and Hovering Hawks (leaving out the typal blocks with geese, ducks, and swallows). Posted in Uncategorized and tagged birds in the air, birds in the air block, farmer's wife, farmer’s wife quilt, quilt, quilt block. Bookmark the permalink. 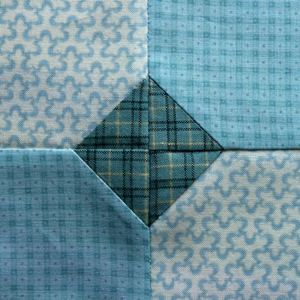 Wow, I am amazed myself how well the seams fit in this block. 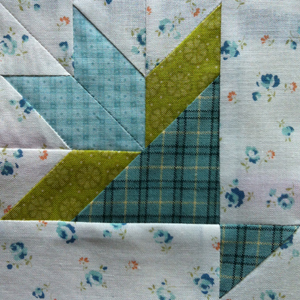 As with most of the farmer’s wife blocks, I paper pieced this one, too. But still, there are seams that have to be done after the paper piecing, and those are always a source of errors and vexation. But with this one, everything went smoothly. Deciding on the prints was not difficult, either. A plaid for the flower pot, some green for the lower part of the bouquet, and some tourquois for the flowers. And to keep it from being too abstract, I used a flower print as background. Very clever! I had several “flowery” blocks so far, one very similar to this: Flower Pot. Oooh, I almost used the same prints—the same colours anyway! Posted in Uncategorized and tagged bouquet, bouquet block, farmer's wife, farmer’s wife quilt, quilt, quilt block. Bookmark the permalink. 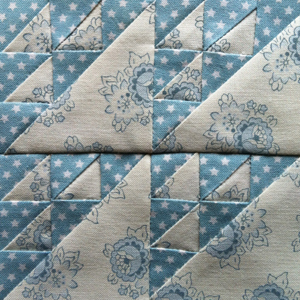 With only few patterns to sew, one really often wanders back in time, trying to remember the many different blocks. Some very successful and satisfying, others not too bad, and some, you even wonder you would have chosen this colour combination of all! Reflecting a large sampler quilt like this gives me much joy. And I am not even done! I am so much looking forward to arranging and joining the 111 blocks. Such a very simple and yet intriguing block. Posted in Uncategorized and tagged bow tie, bow tie block, farmer's wife, farmer’s wife quilt, quilt, quilt block. Bookmark the permalink. This is one of the many patterns consisting of squares and half square triangles. I already wrote about it here, and calico puzzle certainly is one of them. I think throwing together the jigsaw puzzle-like meandering print and the very straight lined all-star print is a challenging combination. 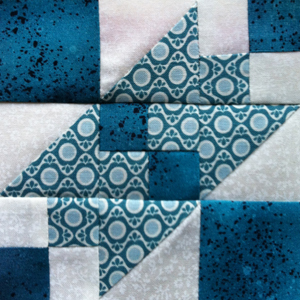 Posted in Uncategorized and tagged box, box block, farmer's wife, farmer’s wife quilt, quilt, quilt block. Bookmark the permalink. I like this pattern a lot. Although it is that simple. “Merely” half square triangles. And only half square triangles. But I found that you can do really a lot with this simple pattern. Think of using three, instead of two prints. Think of using four, or five, or as many as you can find! Here is a broken dishes flag I once did for my America the Beautiful quilt. Posted in Uncategorized and tagged broken dishes, broken dishes block, farmer's wife, farmer’s wife quilt, quilt, quilt block. Bookmark the permalink. 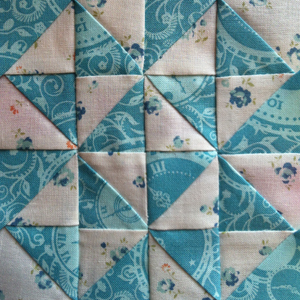 I somewhat looked forward to sewing this particular block ever since I started this project. I cannot really tell why. It’s as simple or complicated a block as any other of the farmer’s wife blocks. Yet, it is another example of how easy you can create a unique block by using only two simple geometric forms. That is ever fascinating to me. Posted in Uncategorized and tagged broken sugar bowl, broken sugar bowl block, farmer's wife, farmer’s wife quilt, quilt, quilt block. Bookmark the permalink.